Awarded to Air Force Active Duty, AFRes, ANG units for extraordinary heroism in action against an armed enemy of the US while engaged in military operations involving conflict with an opposing foreign force on or after 11 September 2001. The GUC requires a lesser degree of gallantry, determination and esprit de corps than that required for the Presidential Unit Citation (PUC). The degree of heroism required is the same as that which would warrant award of the Silver Star which is awarded for gallantry and heroism of high degrees, including risk of life in action. This award will normally be earned by units that have participated in single or successive actions covering relatively brief time spans. Only on rare occasions will a unit larger than a group qualify for the GUC. Extended periods of combat duty or participation in a large number of operational missions, either air or ground, is not sufficient. Approval authority for this award will be the Secretary of the Air Force Personnel Council (SAFPC), however, must be processed through HQ AFPC/DPPPRA. Devices associated with award of the Gallant Unit Citation are Oak Leaf Clusters to denote multiple awards. The Air Force Gallant Unit Citation was established by Secretary of the Air Force James G. Roche. 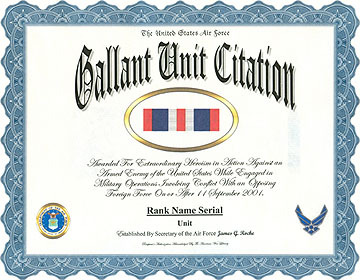 The Air Force Gallant Unit Citation is effective retroactive to September 11, 2001. The Air Force Gallant Unit Citation is awarded to Air Force active duty, Reserve, and Guard units for extraordinary heroism in action against an armed enemy of the United States while engaged in military operations involving conflict with an opposing foreign force. The Air Force Gallant Unit Citation requires a lesser degree of gallantry, determination, and esprit de corps than that required for the Presidential Unit Citation. Nevertheless, the unit must have performed with marked distinction under difficult and hazardous conditions in accomplishing its mission so as to set it apart from and above other units participating in the same conflict. The degree of heroism required is the same as that which would warrant award of the Silver Star to an individual. This award will normally be earned by units that have participated in single or successive actions covering relatively brief time spans. Only on rare occasions will a unit larger than a Group qualify for this award. Although units larger than a Group may submit, it will be extremely rare that a large organization will receive this award due to the degree of valor required. 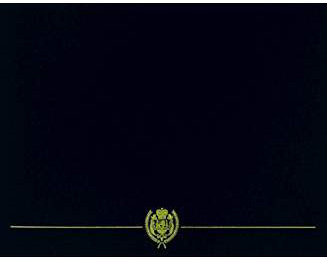 The Gallant Unit Citation is worn after the Presidential Unit Citation and before the Joint Meritorious Unit Award. The first award of the Air Force Gallant Unit Citation was made to the 16th Operations Group at Hurlburt Field, Florida. The 16th Operations Group, part of the 16th Special Operations Wing, was singled out for its performance from the start of Operation Enduring Freedom in October of 2001 to the opening months of Operation Iraqi Freedom, ending in May 2003. The Group was recognized for destroying 1,200 targets, firing 658,134 rounds of ammunition, airlifting 4.1 million pounds of cargo, and flying 7,064 combat sorties.